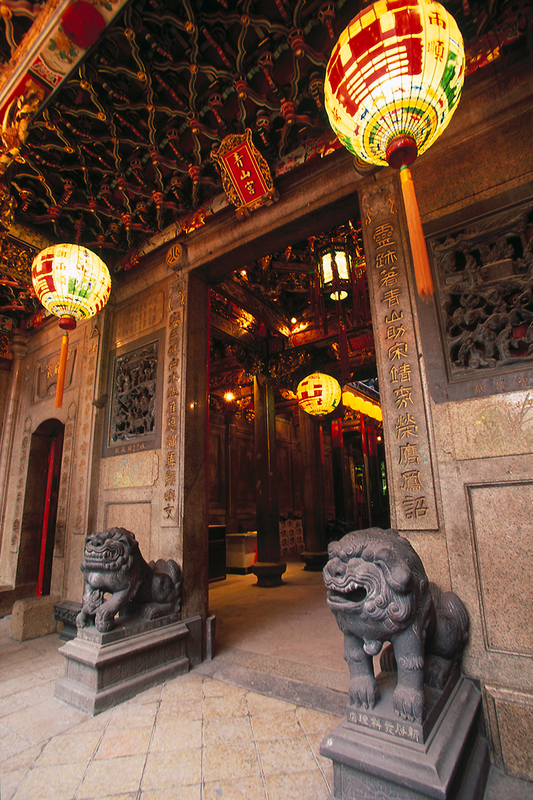 Built in 1854, this temple is home to the god King Qingshan. According to legend, fishermen from Hui-an in mainland China brought the god's image to Taiwan; when they carried it past Old Street (today's Xiyuan Road) they suddenly found themselves brought to a halt; the god refused to move any further. Throwing the oracle blocks to find out what the matter was, the god's devotees discovered that he wanted to stay there, where they later built the temple. An epidemic was raging at the time, but prayers to King Qingshan were sure to bring a recovery; thus the god's grateful devotees increased, and they contributed money to build a new temple-the one that exists today. 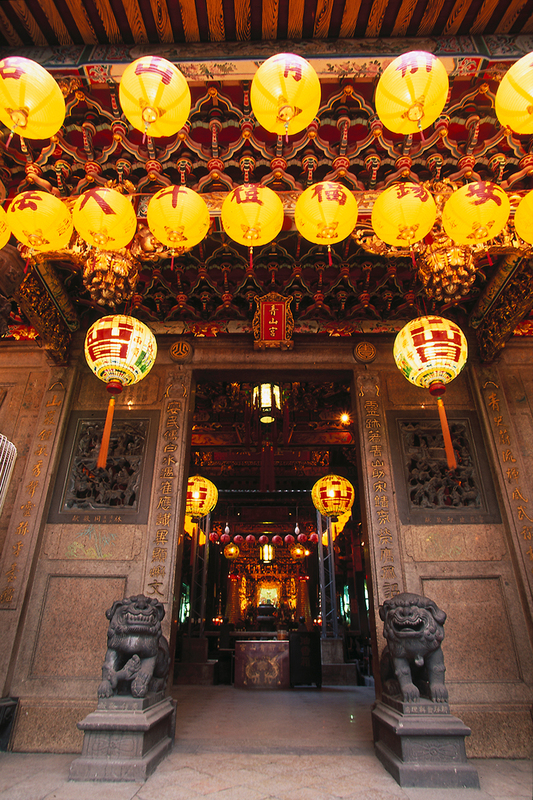 The temple is home to two guardians, General Hsieh Pi-an and Fan Wu-ti. In the early days the chains in their hands were often heard clanging in the temple and the streets nearby, or the generals were seen patrolling the streets. Thus there were very few thieves in the neighborhood. The celebration marking the birthday of King Qingshan is held on the 22nd day of the 10th lunar month (Dec 10, 1998; Nov 29, 1999; Nov 17, 2000). On that day all of the other temples in the area also celebrate the occasion, helping make it one of the most interesting festivals in Mengjia. The approach to this temple takes you past some of Mengjia's most interesting architecture. Sec. 2 of Guiyang Street, which stretches between Qingshan Temple and Qingshui Temple, is lined with red-brick shops in the Taisho-style. These were built during Japan's Taisho reign period (1912-1925), a time when Japan administered Taiwan as a colony. Nat'l Hwy 1 → Exit at the Taipei Interchange → Prov. Hwy 2B → Minzu W. Rd. → Expressway → Sec. 2, Guiyang St.
Nat'l Hwy 3 → Exit at the Zhonghe Interchange → County Hwy 106A → Township Road Bei-91 → County Hwy 114 → Guangfu Bridge → Sec. 2 to 1, Xiyuan Rd. → Sec. 2, Guiyang St.
Take the THSR or train to Taipei Station, transfer Taipei City Bus(No. 49, 218) to Zushi Temple stop.